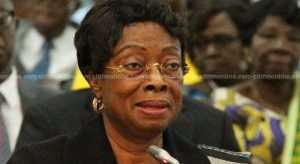 Chief Justice, Sophia Akuffo has ordered the immediate relocation of Mampong High Court to a vacant courtroom at the District Court, pending the construction of a new one, due to its dilapidated state. The building housing the High Court was constructed in the 1950s, and is in a deplorable condition, not befitting its status. This was when she visited the Mampong High Court, the Nsuta and Ejura Circuit Courts as well as their respective Municipal and District Assemblies to round off a two-week tour of the Ashanti Region. Ms Akuffo underscored the need for infrastructural development in the judicial service by the Municipalities and Districts assemblies, to enhance effective justice delivery. She also called for the construction of a new building for the Nsuta District Court and a new residential accommodation for the sitting judge. Madam Akuffo admonished District, Municipal and Metropolitan Assemblies to provide sanitation facilities and good furniture for all public buildings, as stated in their by-laws. Meanwhile, Daasebre Osei Bonsu 11, Omanhene of the Mampong Traditional area and a member of the Judicial Council, announced that the traditional authority is providing a parcel of land to the Judicial Service for the construction of a new High Court building. He asked the Municipal Chief Executive (MCE) to factor this into the Assembly’s mid-year budget. The Mamponghene appealed to the human resource department of the judicial service to transfer competent staff and interpreters to the various courts in the Mampong Municipality. He also requested for the extension of the court digitisation project to the various courts, to speed up the dispensation of justice. Nana Agyakomah Dufie, the queen of Mampong, on behalf of the Traditional Council, gave the Chief justice an honorary status of a citizen of Mampong, in recognition of her contribution to justice delivery in the country.